The Mini Pinhole Blender 120 has one pinhole. 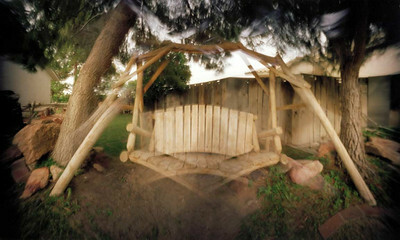 However, with this one pinhole you can easily make 360 degree images. You have to be on a tripod. First you make one exposure. Then you rotate the camera 30 degrees counterclockwise and advance the film one third of a turn. You repeat that process for a total of 12 exposures covering 360 degrees. The individual picture elements will end up in the proper order, but will be creatively blended yielding a unique presentation of the surroundings. 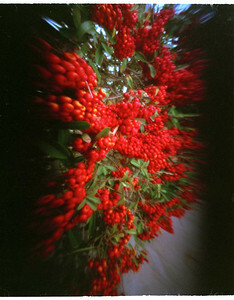 I prefer this camera over the (non-Mini) Pinhole Blender 120. Both models are also made in 35mm size. The company also has some very inexpensive and novel 4x5 anamorphic cookie tin cameras. MiniBlended Swing - There are a lot of pictures of this swing in the other galleries. Here it is a blending of several exposures. Driveway Gate - Clockwise Blend - This blended image of the driveway gate was formed by rotating the camera clockwise . It generates a very different image from the next image in the gallery. 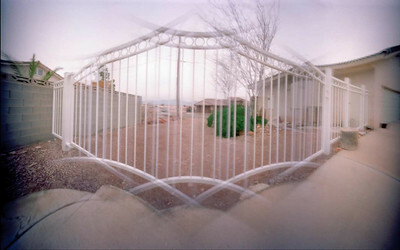 Driveway Gate - Counterclockwise Blend - This blending yields an image closer to reality, but still quite distorted. Driveway Gate - Zone Plate - The camera comes with both a pinhole and a zone plate. The zone plate is a printed target pattern of alternating black and clear concentric circles. All of the edges tend to soften the image, giving it a more dreamy feeling. Backyard - Clockwise Rotation - This blending has each component image backwards and the overall picture is ordered backwards. Heritage Gazebo - Shot from the center of a gazebo, this blending covers about 420 degrees. Note the same street on each end of the image. The Holmes Gang - 15 exposures of 12 seconds each. All blending done in-camera. Photoshop was used only to adjust contrast, tonality and saturation.